HEA helps your child enjoy reading! 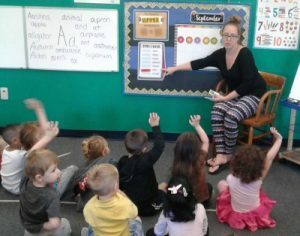 Children Central utilizes HAPPILY EVER AFTER, a reading readiness program, which is part of the SuperKids Reading program used by Neshaminy and many other school districts. It is designed to give children the foundation they need to be successful when they begin formal reading instruction in kindergarten. This effective pre-k curriculum uses beautifully illustrated selections of children’s literature as the basis of the 10 units in the program. 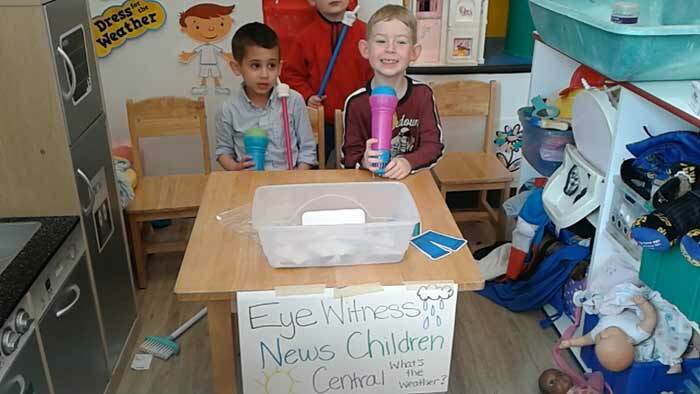 This excellent program includes classic stories to help build vocabulary, and strengthen letter writing and recognition skills, to prepare our Pre-K class well for kindergarten. We end the school year with a very fun and entertaining cap and gown graduation ceremony! The class is then ready to join Cub Camp during the summer months, which is both fun and educational, as we make sure the children are prepared to begin kindergarten in the fall. A good pre k learning and readiness program assumes nothing. Instead, it carefully breaks down and explains tasks. For example, children aren’t just asked to draw a line. First they learn what a dot and a line are. Then, on pages that show a dot at the left of a line, they learn to put a crayon on the dot and trace the line from left to right. After this, they draw a line independently. Finally, only after learning through concrete activity the meaning of under, are children asked to draw a line under something and are introduced to the word underline. This careful, explicit, systematic approach makes all children successful, task by task, and gives them the strongest possible foundation for learning to read. Children, like all of us, learn through visual, auditory, and kinesthetic modalities. Strengthening children’s ability to learn in all the modalities prepares them for reading (which involves mainly the visual modality), spelling (auditory), and writing (kinesthetic). Multimodal practice helps children master skills and concepts regardless of their strengths and weaknesses or preferred learning style. Throughout Happily Ever After, children learn new skills, concepts, and vocabulary by seeing and hearing examples, as well as by participating in physical activities that reinforce their meaning. All of which are based on well proven early childhood education principles. Happily Ever After includes beautifully illustrated stories, lively discussions; and a great variety of hands-on activities, group games, and art projects—all of which delight children. Throughout the program, clear instruction builds success step-by-step, giving children confidence as they develop the skills they need to learn to read. To succeed across curricula in future years, children must develop concepts and vocabulary to comprehend written and spoken language. 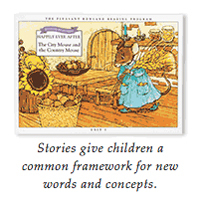 Happily Ever After builds this foundation by anchoring instruction in classic stories from children’s literature. Children listen to a well-known story in the first lesson of each unit and return to it again and again as they move through the other lessons in the unit. The story gives them a common framework for new words and concepts. In addition, new vocabulary, skills, and concepts are introduced in a concrete way through a game that relates them directly to the familiar, physical world. In this way, instruction always proceeds from the concrete to the abstract. Ultimately, children need to develop fine motor skills to be able to write. To build these skills, Happily Ever After provides constant practice in cutting, folding, coloring, gluing, tracing, and drawing. Happily Ever After builds children’s fine motor skills through practice, practice, practice—but practice that takes place in the context of activities children enjoy. Success in school depends on children’s ability to understand instructional vocabulary and follow directions.Following directions involves good listening skills and concentration, often applied to multi-step instructions. It also requires familiarity with common school tasks, such as circling an answer or drawing a line across or under. Happily Ever After builds children’s ability to follow directions by teaching the necessary skills systematically and explicitly and giving children the opportunity to apply the skills in every lesson. To learn to read and spell, children must become conscious first of environmental sounds and then of sounds that make up speech, such as words and syllables. Finally, they must learn to hear phonemes, the small units of speech that correspond to letters. Happily Ever After carefully builds this sensitivity to sounds through direct instruction and daily routines. Children must also learn to attend thoughtfully to the teacher, to the narrator in CD lessons, and to other children. Those listening skills are developed in every activity throughout the program.